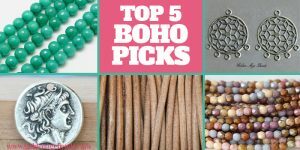 There are many different types of jewelry stringing materials available and it can be confusing to know which one to choose for your project. In this post, we’ll be explaining more about the most common stringing materials that you’ll find and what they are best used for. Genuine leather cord is a popular material to use for stringing beads with large holes and it looks great on its own as a necklace with just a simple pendant attached. 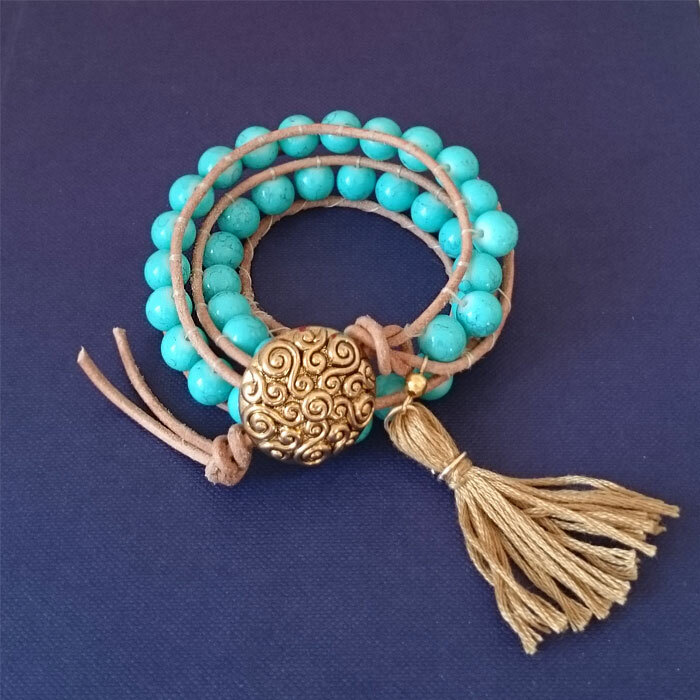 Leather cord is often used in bohemian style or modern casual style jewelry. Wrap bracelets are on trend at the moment and rather than using leather cord for stringing, you can use two lengths of cord to wrap beads around as shown in this picture above. Leather cord is very strong and easy to work with. It knots well, although knots can be quite large depending on the thickness of the cord you’re using. This is a strong material that looks similar to leather cord. It’s robust enough to use for many jewelry-making projects and stands up well when it gets wet – however it doesn’t respond well to extremely low temperatures. Imitation cord is machine made, which means it’s more uniform in size and color than genuine leather cord. Waxed cotton cord is a good alternative to use for bracelets and necklaces if you don’t want to use leather. It’s good for stringing and knotting and is usually regular in color and size. It’s pretty much water resistant so you won’t need to worry about it breaking down. Natural hemp cord is eco-friendly, strong and colorfast. As well as being great for use in jewelry-making, you can also use hemp cord for making home decorations, scrapbooking or macramé. With all types of cord, you can use cord ends to finish off your project or you can simply just knot it. Flexible beading wire such as Soft Flex®, Beadalon and Tigertail is a popular choice when it comes to stringing beads for necklaces and bracelets. It’s so flexible that it’s almost like a thread, except that it’s much stronger. If you’re using beads with sharp edges, flexible beading wire is useful as the bead edges won’t be able to cut through the material. Flexible beading wire is usually available in sizes from .012 to .024 with the latter being the thickest. Memory wire is very strong and retains the shape of a coil. It’s great to use for wrap around bracelets in particular and because of the stretchiness of the wire, it will fit to any size wrist! This wire can also be used for chokers too. 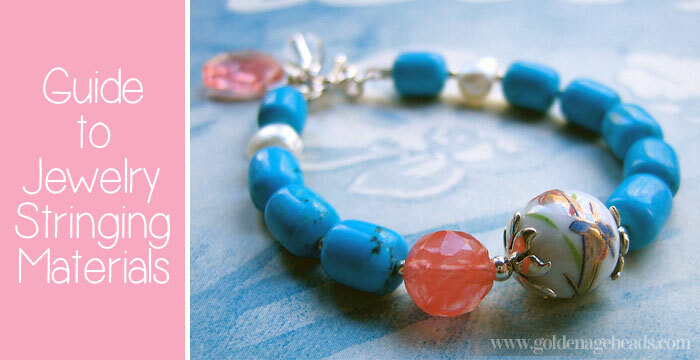 To finish off the ends, you can make a loop with round nose pliers and then attach a beaded charm for extra effect! This type of wire is quite rigid compared to flexible beading wire and it can be bent into shape easily with pliers. You can find copper coated wire in a very thin 34 gauge which is useful for wire knitting right through to a very thick 18 gauge which is good for making heavy wire jewelry. 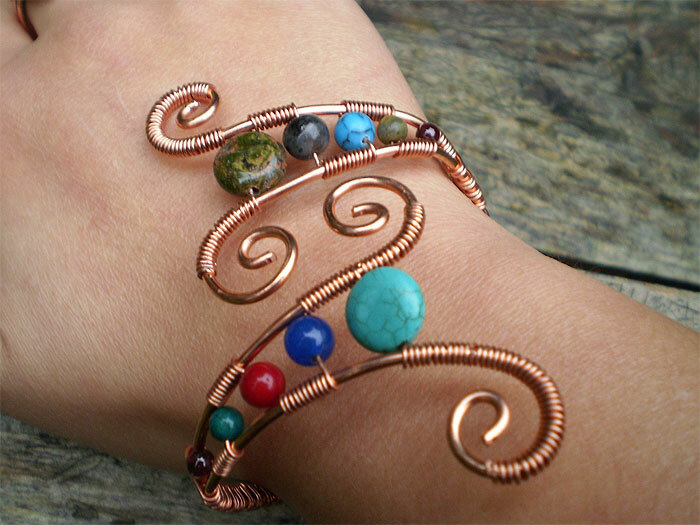 You could use a thick gauge wire to form the sides of a wire cuff bracelet and then use a thinner gauge wire to wire wrap beads around it. You can also use some thick wires to make hammered freeform shapes although it’s best to use wires that don’t have a color coating, otherwise they could scratch upon impact. 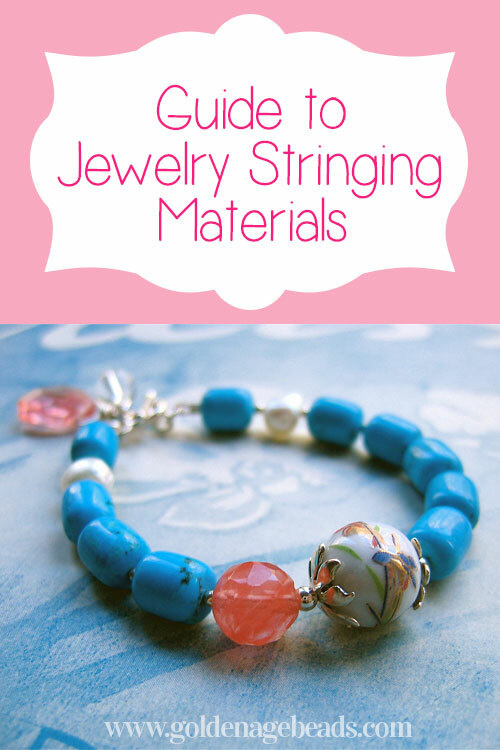 Elastic is ideal for making stretch bracelets and necklaces. 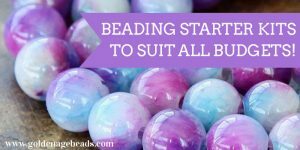 It’s very simple to use – once you’ve finished stringing on beads, you can pull the elastic tight and knot the ends together. Trim off any excess and the knot will disappear underneath the beads. 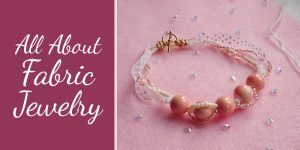 Elastic is available in lots of different colors and thicknesses and is a great material to use for beginners, or if making children’s jewelry which is likely to be subject to regular pulling around! Stretch Magic™ is a type of elastic cord that’s virtually invisible. It’s made from a high-tech polymer that does not crack or become hard over time. Because the ends don’t fray, it’s very easy to string! 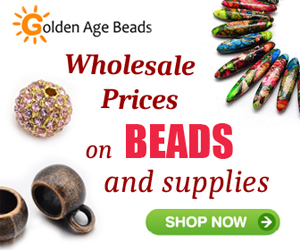 Beading threads like Nymo or Silamide are perfect for beadweaving or bead embroidery projects, when you’re stringing together tiny little seed beads. These threads should be used with a special beading needle (different to a sewing needle) that will fit through the seed bead holes. 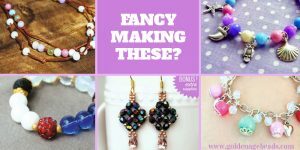 You can create all sorts of amazing things with seed beads and beading thread, including jewelry, purses, miniature beaded animals and even pieces of art. You can use thin ribbon for bead stringing, although you would usually need to use beads with very large holes in order to get the ribbon through. You could use ribbon to make bracelets or necklaces (particularly chokers with a simple pendant) and finish off with ribbon end findings and a clasp. Rattail is a satin cord which is ideal for kumihimo braiding and Chinese knotting techniques. It’s very soft to work with and is ideal for stringing beads with large holes. Silk thread is most commonly used for making jewelry with freshwater pearls or other delicate beads. You can knot in between beads quite easily with silk thread and doing this will allow you to protect the beads from knocking into each other. Silk thread is quite stretchy and is available in all sorts of different colors and sizes. 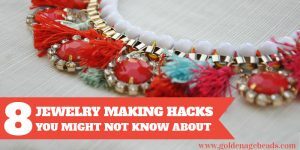 We hope you found this overview of jewelry stringing materials helpful so that you can select the right one for your next project with ease! If you enjoyed this post, please take a moment to share it with your followers on social media. I started using Chinese knotting cord size 0.4mm from Marion Jewels in Fiber and I coat the the end with Stiffy so I don’t have to use a needle. It works with seed and bugle beads and comes in an amazing range of colors! It is very sturdy beacause it is a braided strand. I usually use Tiger Tail beading wire but have found that it stretches over time and can be tricky to turn back through beads to finish a necklace once it has got a kink in it.